Good Cook Doris: When He Fends for Himself - Taco Town! Recently the wife was away for 5 days and I had to scrounge together some meals in order to survive. I started off slowly. For the first two days I snacked on granola bars, ice cream, fruit, and gummy bears. I felt like I could indulge a little bit because I had lost 5 pounds during the Fall. Eventually though, I wanted some real meals so I ordered out for a Greek salad and a calzone. It was good and hit the spot, but it's nothing worth writing about. The next day I went to Whole Foods for a little grocery shopping and decided to get dinner from their taco and burrito bar. Whole Foods offers 3 tacos for the low low price of $4.99 so it looked like a good deal. They actually have a lot of options for filling your taco and I decided on one chicken, one beef, and one fish taco. They use soft corn shells for the outside of the taco and fill it with a good amount of protein. 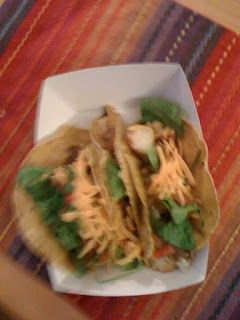 I had them add a little lettuce, some salsa (which had some good spice to it), cheese, guacamole, and cilantro. My only complaint about my experience was that there was a weird guy who was standing way to close to me who was fascinated by the sight of a taco bar at Whole Foods. I actually couldn't see all the options clearly because he was in my way. I kept waiting for him to lose interest but I guess filling tacos tops the entertainment options in my town. I've been wondering if the taco bar is any good. Thanks for the report!